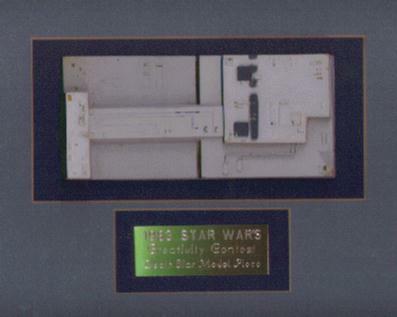 This piece of deathstar was awarded to Mike McKinnis in the 1983 Star Wars Fan Club Creativity contest. It was used in the Death Star model from Return of the Jedi. It came with a letter congratulating Mike for his entry. The plaque reads "1983 STAR WARS Creativity Contest, Death Star Model Piece". 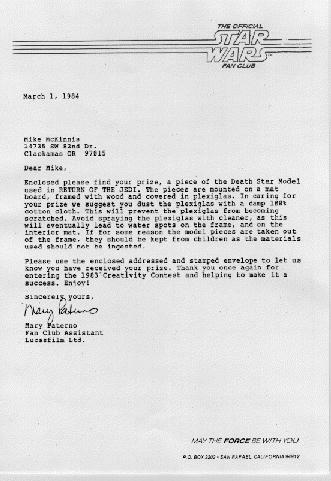 This is the letter that accompanied Mike McGinnis' deathstar piece as a prize in the 1983 Star Wars Fan Club Creativity Contest. The letter reads: Enclosed please find your prize, a piece of the Death Star Model used in RETURN OF THE JEDI. The pieces are mounted on a mat board, framed with wood and covered in plexiglas... Mary Faterno, Fan Club Assistant, Lucasfilm, Ltd.